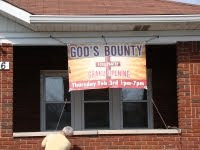 Don't forget to contribute to God's Bounty by purchasing a $10 Simply Give card at Meijers on Southport Rd. When you buy/donate $10 to God's Bounty they match it. The campaign will be going on until Jan. 3, 2015. Get the cards by the display near the checkout counters. Donations from Meijers are a huge part of how we purchase food for the pantry. Thank you to all of you who have participated in this campaign so far - you are a blessing! Thank you to Acton United Methodist and Nativity for their food donations to the pantry on Sunday November 23. It never ceases to amaze me how God works. 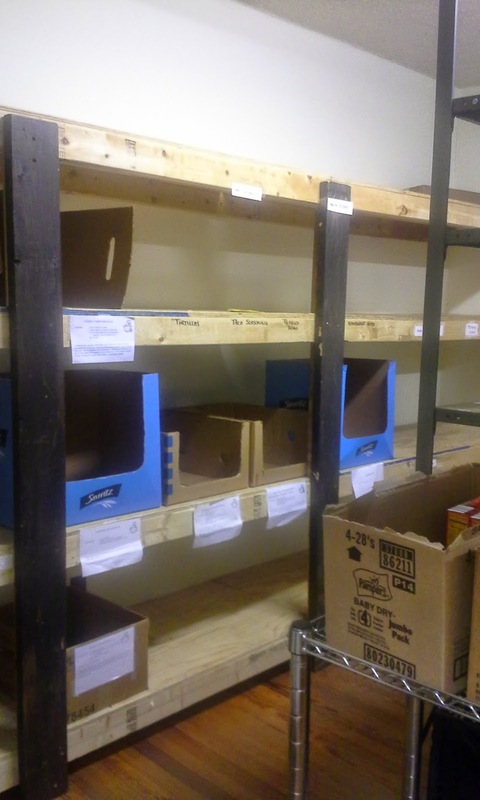 Both of these churches had food drives and helped to replenish the shelves with a total of 1200+ lbs. of food. There were several other donations also from individuals and some scout troops. You all are amazing and are definitely responding to God's call to feed the hungry. November 20 was our busiest day ever! 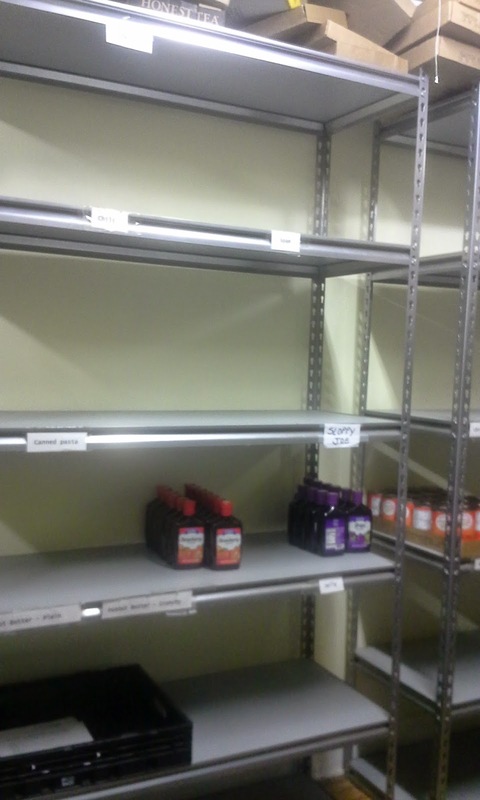 We saw 128 families feeding over 600 people and the shelves are bare! We are blessed to be able to serve the people in our community in this way and know that God will provide. Thank you to all the volunteers that tirelessly worked that day. You are appreciated!! God's Bounty is happy to partner with Meijer at 5325 E. Southport Road to provide hunger relief to families in Franklin Towship through the retailer's food donation program, SIMPLY GIVE. We encourage community members to help us fulfill our mission of helping feed the hungry by purchasing a $10 Meijer SIMPLY GIVE food donation card during their next shopping trip from March 30 to May 12. The amount donated at the end of the compaign will be converted to Meijer food-only gift cards and given to God's Bounty to purchase food for the pantry. Visit www.meijer.com to learn more about SIMPLY GIVE. 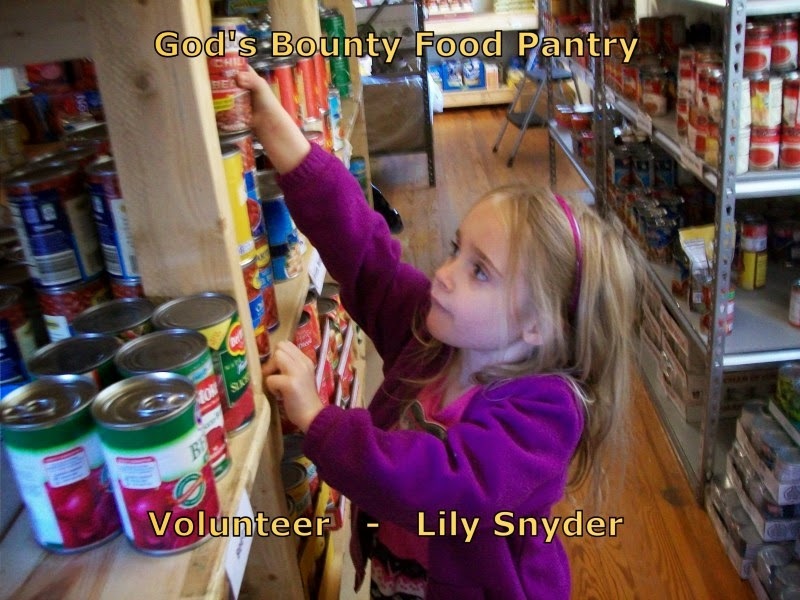 Two years ago Lily was involved in making birthday bags at her church to be given out at God's Bounty food pantry. She would occasionally visit with her family to drop off food and last year had a few opportunities to stay and help. She quickly discovered that she enjoyed helping others. Many young people have volunteered at the pantry over the last 3 years and have found the joy of helping others as Lily has and has helped them to see that age and size doesn't matter when it comes to showing care and kindness to others. Admission: $5.00 and a donation of canned food or nonperishable food for the food pantry. The admission gives you tasting of all the chilis and a chance to vote for your favorite. Help us feed those in need in the community. On February 9th the Franklin Twp. schools were closed for the 4th day because of the winter storm that brought 11 inches of snow and hazardous road conditions. The pantry, therefore, was closed for the first time in three years because of weather conditions. We want to send a big "THANK YOU" out to Bob Marlin for clearing the parking lot and to the other awesome volunteers who cleared the walk, ramp and steps the week before also. We have many more days of winter ahead of us, hopefully not as bad as this last week.